History of Yougakudan 5 ~ Akyu's Untouched Score vol.5 (幺樂団の歴史５　～ Akyu's Untouched Score vol.5, Yougakudan no Rekishi ~ Akyu's Untouched Score vol.5) is an official doujin album by Team Shanghai Alice released on 2007-12-31 (Comiket 73). It is the fifth and final volume of the Akyu's Untouched Score collection, presented by Hieda no Akyuu alongside Reimu Hakurei. It (almost) contains the full soundtrack from the first PC-98 game Highly Responsive to Prayers, in its arranged FM version heard in Mystic Square's music room. The theme "Shrine of the Wind" wasn't included in this CD because it's an unused theme from the original game, and was also not included in the Mystic Square's music room. 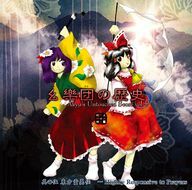 There is also a bonus track on this CD that isn't heard in the original games, that been "Theme of Eastern Story", which can be described as the basic version of the Touhou Project main theme melody that's arranged in many themes across the series, especially with each title screen of the Windows games. Also, ZUN names the 13th track "Angel of a Distant Star" (星幽天使, Seiyuu Tenshi), while he used "Swordsman of a Distant Star" (星幽剣士, Seiyuu Kenshi) in Highly Responsive to Prayers. It should be noted that, although the English subtitle of the original game uses the definite article "the", it was omitted in this album for unknown reasons. For comments on the original music, see Highly Responsive to Prayers/Music. History of Yougakudan "Touhou Rei'iden ~ Highly Responsive to Prayers"
This final volume is the soundtrack of Highly Responsive to Prayers. For me, this is the absolute starting point. There are a lot of really good songs in here, if I do say so myself. However, there aren't a lot of songs, so I decided to add something as a bonus track. It really is just an extra, but... by leaving it to the end, it becomes another sort of starting point. To be frank, those 13 years have passed just like that. You can't let your days pass by with regrets. Before you know it, your strength of will and body are taken away from you, and all that's left over are lead dreams - a heavy-metal spirit that won't even cross over the Sanzu River. Somebody said that death is the great equalizer; I wonder who it was? I get the feeling that a few humans live out their lives in their own way and become something else entirely.